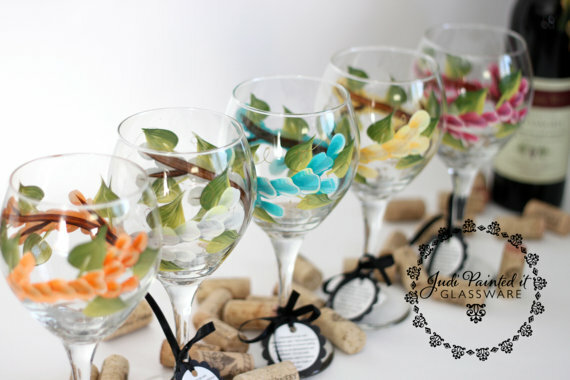 Wondering how to give a wedding toast guests will remember long after the wedding day? Want a cheat sheet featuring seven surefire secrets that work? You’re in luck because today we’re showing you how to give a wedding toast with secrets to make your speech memorable. If you’re the Maid / Matron of Honor or Best Man in an upcoming wedding, chances are you’ve already heard the news: you’re responsible for writing and delivering a toast to the bride and groom at the wedding reception. Now, before you head for the hills and ditch the dutiful badge of honor, relax; the key to giving a memorable wedding toast is proper preparation. Read on to find out our seven favorite surefire, tried-and-true secrets to giving a wedding toast whether you’re a public speaking expert or true beginner. 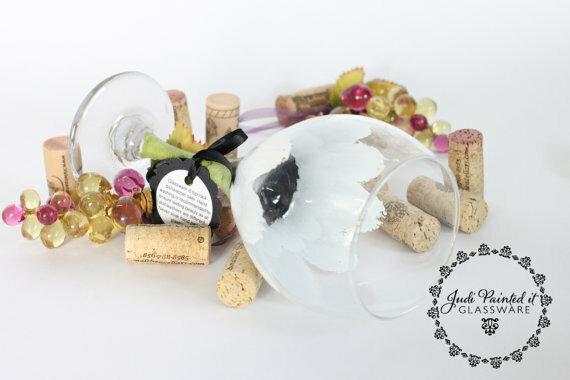 And, in keeping with the true Emmaline Bride handmade wedding spirit, we’re also sharing some amazing hand-painted toasting flutes and wine glasses by Judi Painted It, featured artisan in The Marketplace, to get you in the toasting spirit. Cheers! 1. Keep it short, sweet, and sincere. The KISS method (keep it simple, stupid) can be applied to nearly every aspect of life for words of wisdom. 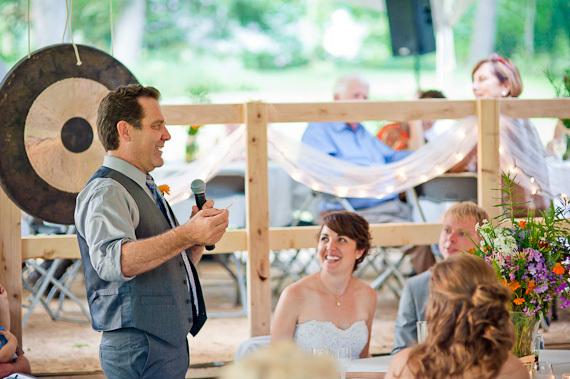 For wedding speech tips, we think simple (short), sweet, and sincere are also applicable. By tying in all three, you can be assured your words will be heartfelt, honest, and guests will understand every word you say. Make the bride and groom remember why you were selected in the role you were given and make them proud of the speech you have prepared. “One time, in band camp…” might sound like a hilarious start to a speech filled with raucous laughter, but nine times out of ten it is more appropriate for a bachelor or bachelorette party. The bride and groom ought not be embarrassed in front of friends, family, parents, grandparents, children, clergy, co-workers… the list goes on. Even though your story may be hilarious, it’s best to avoid embarrassing the bride or groom with a story certain to turn either of them a bright shade of pink. Also, don’t bring up any exes – ever. They’re an “ex” for a reason. And, a funny story is always welcome in a speech as long as it doesn’t embarrass anyone. If in doubt, run it by the groom or the bride several weeks in advance, just in case. There may be topics that are “off limits” – it’s always better to be safe than sorry. Also, try to tie in a word or two about the bride and/or groom, how they met, or how you met him or her. 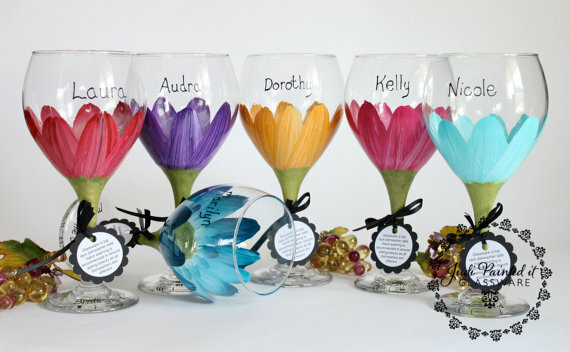 Personalization, as we discussed yesterday, is a key element to every wedding. For obvious reasons, avoid any alcohol before giving your wedding toast. If you need one drink to calm the nerves, make it a small one. 4. Rehearse until you feel comfortable with the speech. Write out the speech on note cards, rehearse it in front of a friend, and read it to yourself a few days before the wedding until it is almost memorized. If you can recite it from memory, even better; keep the note cards in your pocket just in case. 5. Keep it fresh, funny, and down to earth. If you memorize your speech, this one will be a breeze! Be sure to give guests plenty of eye contact while reading your speech and refer to the bride and groom. Eye contact and successful speeches go hand in hand. 6. Fake out your fears. Not many people like to give a speech, but don’t let your fear of public speaking equate to ducking out of your speech-giving duties. Even the least experienced public speaker can fake a feared speech with confidence. If you’ve rehearsed, practiced in front of a friend, and prepared the speech on note cards just in case, you’ll rock that mic. Speak slowly, loudly, clearly, and don’t forget to smile! It’s quite an honor to give a speech; be sure to enjoy every minute of it. 7. 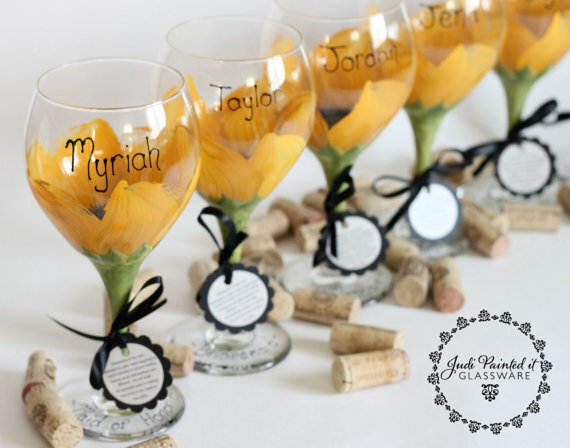 Tie in a toasting gift for the bride and groom. These are lovely! I adore the brilliant floral prints just in time for the summer wedding season! To view more from this beautiful collection or to place your order, please visit Judi Painted It and let her know Emmaline Bride sent you! 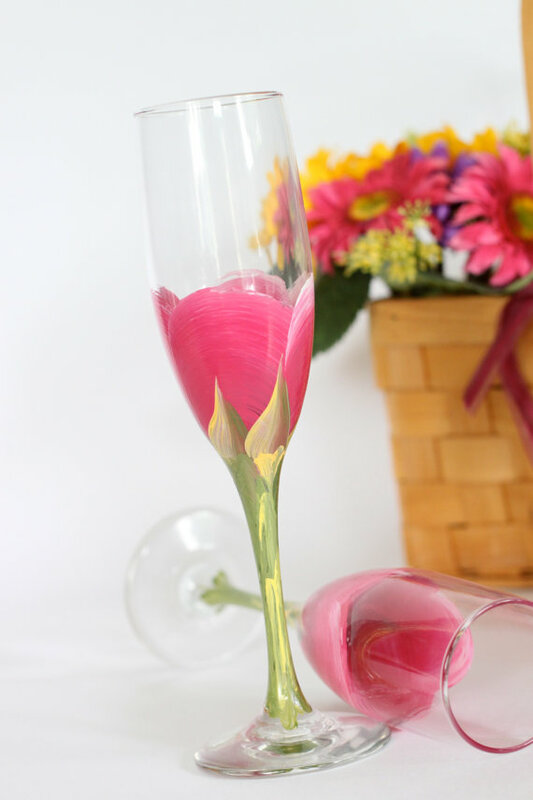 We hope you enjoyed our tips on how to give a wedding toast. If you have other pointers, be sure to include them below; we’re love to hear from you! P.S. Have a wedding question? Just Ask EB! This week, we launched our new ‘Dear EB’ feature where you can submit questions to be answered in future blog posts. We’ve already had a huge response to our new service (thanks, brides – we love you!) and we want to hear from YOU, too! It’s easy to get started – and, it’s FREE! Simply click here to submit your question. You’ll be able to read real questions from brides just like you here in our blog soon! So, be sure to send us those questions! 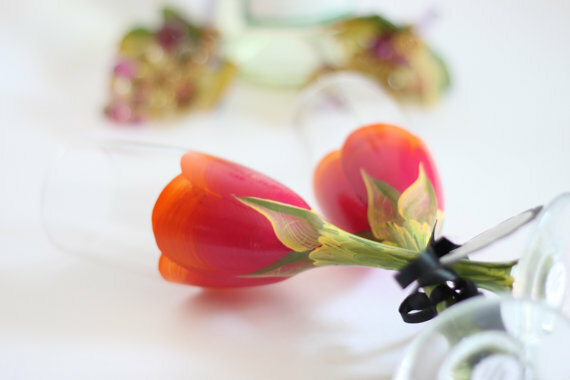 Amazing post,that’s glass is looking very beautiful,thanks for the review.